Winner, 2018 PEN/E.O. Wilson Prize for Literary Science Writing Short-listed for the 2018 Wellcome Book Prize A Top 10 Science Book of Fall 2017, Publishers Weekly A Best History Book of 2017, The Guardian "Warning: She spares no detail!" 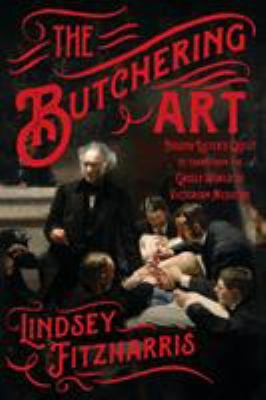 --Erik Larson, bestselling author of Dead Wake In The Butchering Art , the historian Lindsey Fitzharris reveals the shocking world of nineteenth-century surgery and shows how it was transformed by advances made in germ theory and antiseptics between 1860 and 1875. She conjures up early operating theaters--no place for the squeamish--and surgeons, who, working before anesthesia, were lauded for their speed and brute strength. These pioneers knew that the aftermath of surgery was often more dangerous than patients' afflictions, and they were baffled by the persistent infections that kept mortality rates stubbornly high. At a time when surgery couldn't have been more hazardous, an unlikely figure stepped forward: a young, melancholy Quaker surgeon named Joseph Lister, who would solve the riddle and change the course of history. Fitzharris dramatically reconstructs Lister's career path to his audacious claim that germs were the source of all infection and could be countered by a sterilizing agent applied to wounds. She introduces us to Lister's contemporaries--some of them brilliant, some outright criminal--and leads us through the grimy schools and squalid hospitals where they learned their art, the dead houses where they studied, and the cemeteries they ransacked for cadavers. Eerie and illuminating, The Butchering Art celebrates the triumph of a visionary surgeon whose quest to unite science and medicine delivered us into the modern world.